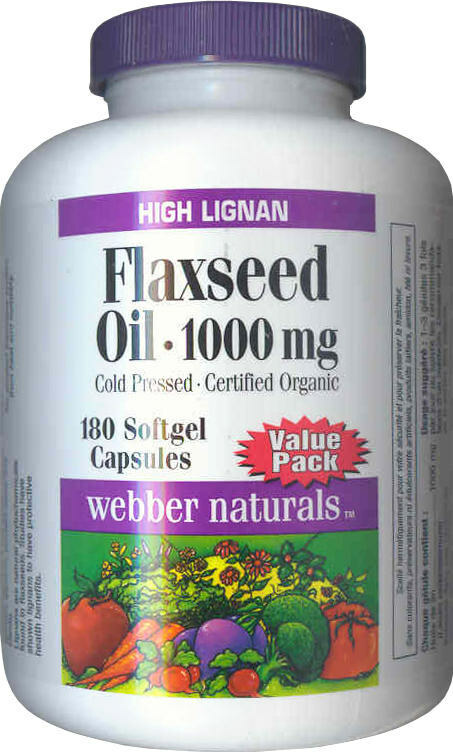 Size (inches): 3.15" X 3.15" X 5.51"
Webber Naturals Certified Organic Flaxseed Oil comes from Canadian-grown flax. The cool, northern latitudes produce superior flaxseed oil, high in omega-3 fatty acids. Solid scientific research shows that these fatty acids may be protective against cardiovascular health concerns because they help to maintain healthy triglyceride and cholesterol levels. Webber Naturals Flaxseed Oil is not refined, deordorized or bleached and is regularly tested for peroxides, to guarantee a fresh, effective product. Small amounts of vitamin E has been added to prevent oxidation. Suggested use is one to three capsules a day. is flax seed is an diet supplement? Flax seed, called linseed in some countries, is a good source of dietary fiber, omega-3 fatty acids, and lignans. Like most vegetable oils, flax seed oil contains linoleic acid, an essential fatty acid needed for survival. But unlike most oils, it also contains significant amounts of another essential fatty acid, alpha linoleic acid (ALA). ALA is an omega-3 fatty acid. To a limited extent, the body turns ALA into eicosapentaenoic acid (EPA)�an omega-3 fatty acid found in fish oil - which in turn converts to beneficial prostaglandins. (Prostaglandins are hormone-like substances made in many parts of the body rather than coming from one organ, as most hormones do.) Flax seed is useful in cases of constipation, systemic lupus erythematosus, high cholesterol, benign prostatic hyperplasia (BPH) and ulcerative colitis. I have been unable to find any data that would confirm flax seed to be beneficial in cases of weight loss or dieting. If you are looking for an herbal supplement to assist with diet and weight loss, ZooScape.com does carry several products that may be of interest to you! Grapefruit Plus Diet is an effective component of any weight loss program! Everyone is talking about Grapefruit Plus based upon the success of the so-called "Mayo Clinic Diet"! Research has shown that Grapefruit supplements can prevent the absorption of excess dietary fats and carbohydrates, thereby aiding in weight loss. Hippocrates, the Greek Father of Medicine, prescribed Apple Cider Vinegar for its powerful cleansing, healing and germ fighting abilities. TerraVita Premium Collection Apple Cider Vinegar is used for weight loss, digestive difficulties, joint pain and infections. Apple Cider Vinegar also serves as an effective blood thinner, a detoxifier and / or a diuretic. Garcinia Cambogia also known as Citrimax, contains 50% hydroxycitric acid (HCA) which works with the body's own natural use of calories. It suppresses appetite by redirecting calories away from fat production and towards the formation of glycogen. Glycogen is the stored form of glucose, one of the body's primary sources of energy. Increased glycogen production and storage is the body's normal way of signaling the brain's satiety centre that enough food has been eaten. Fat Burning Complex is a combination of Garcinia Cambogia and Java Tea. Garcinia Cambogia effectively redirects calories away from fat production to form glycogen, influences appetite and increases energy while Java Tea helps to reduce cholesterol and decrease water retention. Metabolism Formula is a combination of Papaya and Garlic. Papaya provides us with many benefits: it aids in the breakdown and metabolism of protein, exhibits anti-ulcer action, and helps relieve indigestion. Papaya leaf contains the powerful proteolytic enzymes "papain" and "chymopapain", which digest proteins, small peptides, amides, and esters. Their activity extends to carbohydrate and fat. They are more effective than naturally occurring proteases like "pepsin" and "trypsin". Garlic assists in weight loss efforts when combined with Papaya, as it further aids the digestive system in processing of foods. Please remember that both diet and exercise do play a large factor in your weight loss and are needed in combination with any of the above supplements. And don�t worry if you have a little slip here and there � it happens to the best of us! Suggested Usage: 1 to 3 softgel capsules 3 times daily or as directed by a physician. Keep out of reach of children. Encapsulated in a soft gelatin capsule (gelatin, glycerin, purified water, and carob). Webber Naturals Flaxseed Oil is not refined, deodorized or bleached and is regularly tested for peroxides, to guarantee a fresh, effective product. Small amounts of vitamin E has been added to prevent oxidation. For 50 years the webber name has been trusted in North American households as the source of Vitamin E. Now webber naturals is a 'natural' extension, bringing consumers a wide range of vitamins, minerals, herbs and special supplements to meet their families' health and nutrition needs. I am a Vietnam vet and this is a great book to read because most people don't have any idea what we went through. This book gives you a great overall picture of how bad it really was. To get treated the way we were when we got back to the real world was uncalled for. I wish a lot more people could see what it was really like, and then they would change their mind about Vietnam vetrans. If you are a 'nam vet, then you also need to read this book. If you have not been to the WALL you need to go. It would have been my honor if I had served with Col. Moore. Bless him and all the men that served under him. Joe is a hero just for being there on his own free will. I think even all draft-dodgers should be made to read this book.